Rewarding your employees is a great way to motivate them to get out there and make profits for your business. Apart from the insurances such as medical, dental and life many companies offer gift vouchers, free memberships and discount coupons to their employees as part of an employee benefits plan. The ideology behind having such a plan serves a dual purpose. It makes the employee feel valued and a part of a family-like organisation and projects the company as a choice employer because of the existence of such a plan. Store owners and retailers although, may not invest in long-term employee benefit plans considering the fact that employees do not always stay for a long period. A good employee benefit can be a financial package for providing retirement or separation compensation to a regular employee upon formal separation from a company after a pre-determined period of service. This type of employee compensation is probably the strongest employment benefit offer that a stable and organised company can offer its workforce. Gift or meal coupons, like a Sodexho Pass which allows the users (employees, in this case) a certain discount on products that allow Sodexho passes to be used. Store owners often use such employee benefit plans of discount vouchers instead of pension benefits or life insurances because of shorter term of employees. National companies offer their employees customised insurance plans for covering them against serious/terminal illnesses, accidental death and other such health claims. Offering benefits to the dependents of the employee is also fast becoming a corporate strategy used to ensure the commitment and sincerity of employees. Many businesses are also offering onsite childcare, pet insurance, domestic partner benefits and meal reimbursements for employees that typically put in overtime. Taking good care of your employees is a must. Many perceive this as an expensive task, as it means providing the employee with vacations, bonuses, incentive pay, insurance, etc. But to avoid it totally can prove to be catastrophic to the company. Everybody needs a little bit of encouragement, a word of appreciation or a pat on the back. With employee benefits, many of the perceived insecurities of employees with relation to the dedication of the company to their (employee’s) gain evaporates. It is the much needed motivation that an employer can provide to an employee. The employee feels special that someone’s looking after him/her. Research proves that an employee, who is looked after by the company in terms of benefits puts in more effort and energy into his/her work which in turn, of course, profits the company. 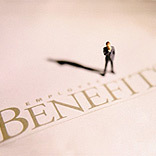 It takes very little effort, a certain extra investment and a lot of thoughtfulness to create an employee benefit plan. And rarely do they go un-appreciated by employees. Sincerity and allegiance to the company are two sentiments that are outcome of benefit plans which aim at letting the employee know that (s) he is wanted and valued. A company which understands and extends benefits to meet the employees' needs creates a trust in the employees’ minds. The employees in turn work harder and are more dedicated and productive because they have security and respect in their job. Incentives also keep the employee focussed on the welfare of the company which then can depend on them (employees) and they grow together.